The B-Complex vitamins are bio-transformed and are essential for helping maintain energy throughout the body and for a healthy nervous system. 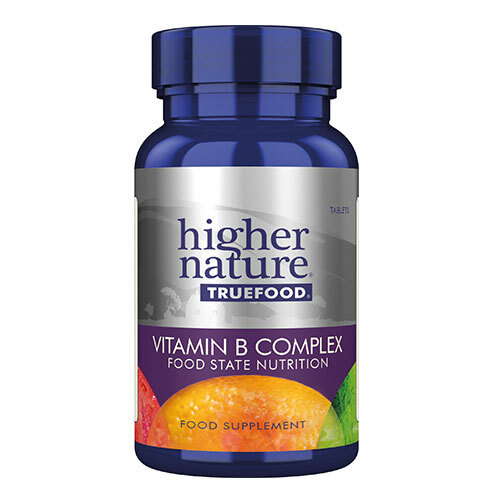 True Food B Complex provides high levels of each B vitamin, plus bio-trandsormed Vitamin C and Magnesium. Vitamin B is a complex of several vitamins. The name arises because it was once considered a single vitamin, much like Vitamin C or Vitamin D. Since later research has shown it is in fact a complex of chemically distinct vitamins that happen to often coexist in the same foods, the name has gradually declined in use, being replaced by the generic term `the B vitamins`, the vitamin B complex, or by the specific names of each vitamin. Healthy skin and muscle tone. Healthy Immune and nervous system function. Proper cell growth and division — including that of the red blood cells. Proprietary mixture: magnesium chloride, niacinamide, calcium pantothenate, ascorbic acid, biotin, pyridoxine HCI, riboflavin, choline, inositol, PABA, thiamine HCI, folic acid, cyanocobalamin, with enzyme digested S.cerevisiae (with soya); natural Lithothamnion calcarea, magnesium citrate, anti-caking agent: stearic acid*; coating: methylcellulose (glycerine); anti-caking agent` magnesium stearate*, anti-caking agent: silicon dioxide; bulking agent: ethyl cellulose; natural vanilla flavour (agave syrup; flavour: vanilla extract; colour: caramel). Adults and children over 8 years: Take 1 tablet a day, with or between meals, or as your health professional advises. The True Food supplements are fermented in a special yeast culture, however once the fermentation process is complete the long chain proteins in the yeast culture are broken down and it is these that commonly cause problems such as allergies. Therefore the True Food Supplements can be tolerated by most people. Below are reviews of True Food Vitamin B Complex - 90 Tablets by bodykind customers. If you have tried this product we'd love to hear what you think so please leave a review. Question about True Food Vitamin B Complex - 90 Tablets Are the True Food supplements suitable for those with an intolerance to yeast? Question about True Food Vitamin B Complex - 90 Tablets Are the nutrients in the True Food range synthetic? Question about True Food Vitamin B Complex - 90 Tablets Does this product contain co-enzyme forms of B vitamins or does the liver need to convert the vitamins to their active forms? Because the b vitamins have been incorporated by a living process in a living cell all the necessary co-factors will be present, including the co-enzymes, although it is not possible to ascertain the exact proportions of each. Indeed they may vary from batch to batch, slightly. Question about True Food Vitamin B Complex - 30 Tablets Are the True Food supplements suitable for those with an intolerance to yeast? Question about True Food Vitamin B Complex - 30 Tablets Are the nutrients in the True Food range synthetic? Question about True Food Vitamin B Complex - 30 Tablets Does this product contain co-enzyme forms of B vitamins or does the liver need to convert the vitamins to their active forms? The B Complex vitamins are bio transformed and are essential for helping maintain energy throughout the body and for a healthy nervous system. 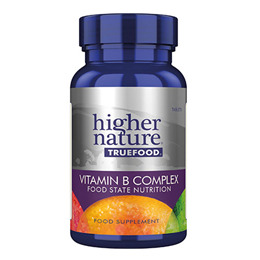 True Food B Complex provides high levels of each B vitamin, plus bio-trandformed Vitamin C and Magnesium.